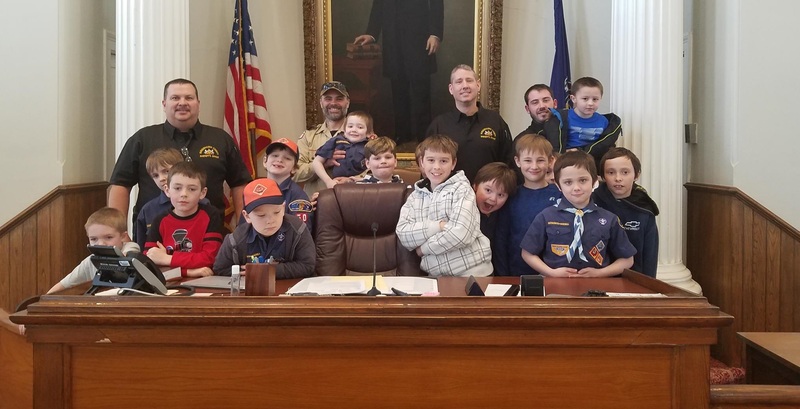 Susquehanna County Sheriff Lance Benedict (top, back, left) welcomed local Cub Scouts to the courthouse recently to work with his department and that of the district attorney to learn about forensics for a merit badge. On April 14, Benedict will be honored by the Baden-Powell Council of the Boy Scouts of America with the Susquehanna County Distinguished Citizen Award. 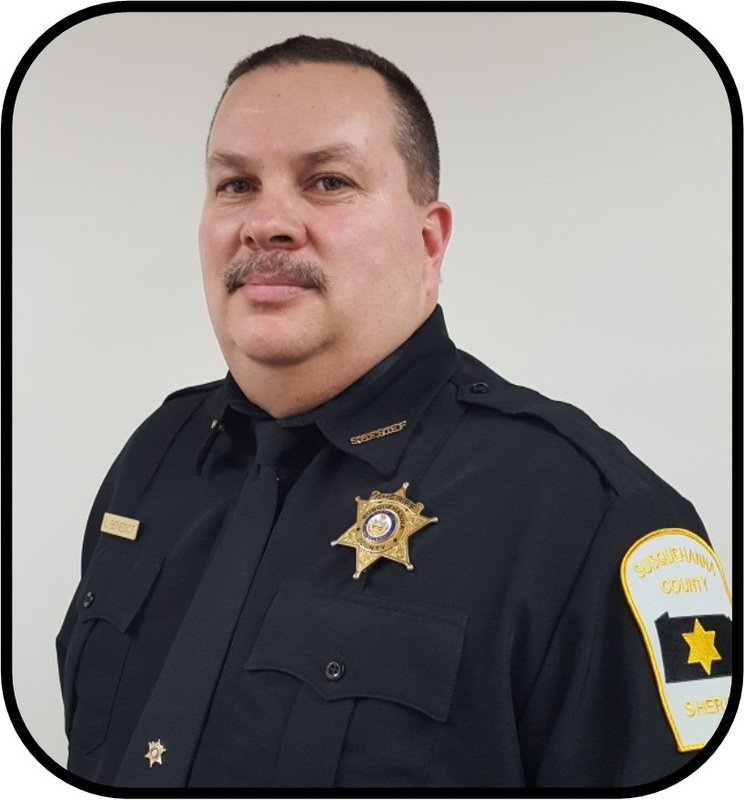 The Baden-Powell Council of the Boy Scouts of America is finalizing plans for its 28th annual Susquehanna County Distinguished Citizen Award Dinner and will honor Sheriff Lance Benedict (above) this year. The event will be held on Saturday, April 14 in the Elk Lake High School Gymnasium and the buffet meal will be prepared by students of the Susquehanna County Career and Technology Center. Benedict was selected by he Baden-Powell Council for dedication to today’s youth and tomorrow’s leaders. A number of local dignitaries will be on hand to speak on his behalf. While sincerely moved by the nomination, Benedict was also quite humbled by the acknowledgment. Benedict joined the Hop Bottom Hose Company as a volunteer when he was 16 years old. He has served as Susquehanna County sheriff since 2002. He strongly believes that today’s youths need to be directed to avenues of participation in civil activities and given ample opportunities for learning about responsibility to community. As a lifelong member of the fire company, Benedict helped get the age of admission for volunteers lowered to 14. Not only has that provided some more manpower for the company, the lack of which most volunteer departments face, it also helps with retention. The earlier youths get involved with an organization as tight-knit as a fire company, he noted, the more likely they are to stick with it. “What an awesome ‘family’ to be part of and to work with,” Benedict stated. “He’s exemplifies leadership,” Mike Redding said of Benedict and the respect he garners from youths. Redding is the former district chairman of the Delehanna Scouting District, which serves most of Susquehanna County, and charter representative and merit badge counselor for Troop 50. He has also served on the Distinguished Citizen Award committee and describes Benedict’s commitment to youth and community as the epitome of what the ceremony is all about. “You couldn’t find a better servant that Lance Benedict,” Susquehanna County Commissioner Alan Hall concurred. “He has a heart bigger than anyone I know. You won’t find a better person when it comes to dealing with kids and wanting them to succeed.” Hall credits Benedict for getting the county’s version of the National Night Out program up and running to help build the relationship between communities and law enforcement. “He’s all about helping the public see them as there to help and not as the ‘bad guys’ like we see on TV,” Hall explained. After a number of years of hosting a single, well-attended, Nights Out event, Benedict took the initiative last year to spread the program to numerous municipalities throughout the county. In between serving hot dogs and slices of watermelon to attendees, Benedict doesn’t hesitate to drop down on one knee to have a face-to-face meeting with a child. Scouting, Redding suggested, is a suitable vehicle for Benedict to spread his message of the importance of citizenship. Benedict’s sheriff’s department and representatives from the district attorney’s office recently hosted a group of Cub Scouts working on their Forensics merit badge at the courthouse. Benedict routinely invites both Boy and Girl Scouts to assist him with National Night Out. Dinner on April 14 will be preceded by a silent auction at 5 pm, and the meal and program will begin at 5:30. The menu includes salad, beef bourgignonne, pan seared salmon, chicken cordon bleu, rice pilaf, vegetable dinner rolls and an assortment of desserts. Tickets are $45 each and can be ordered through the Baden-Powell Council of the Boy Scouts of America by calling Joshua Hanes at 607-648-7888. Donations are also being accepted by those who cannot attend the banquet. All proceeds will support Scouts in the Baden-Powell Council, which covers five counties in New York state, plus Susquehanna County in Pennsylvania.